Potatoes are versatile, tasty, and rich in vitamins. They’re easy to grow and can keep for the entire winter. The downside is that they take up a lot of room in the garden, which is a particular challenge if you have a small yard or only have access to a balcony. A potato tower is an excellent solution. Ranging from two to four feet high, these vertical gardens can be created in bags, bins, boxes or constructed from wooden boards, or simply from a cylinder of metal fencing lined with straw and filled with soil. Simple to build, they also produce a high yield – up to 100 pounds in a larger unit with proper care! Below you`ll find two simple systems which we yield up to 50-100 pounds! 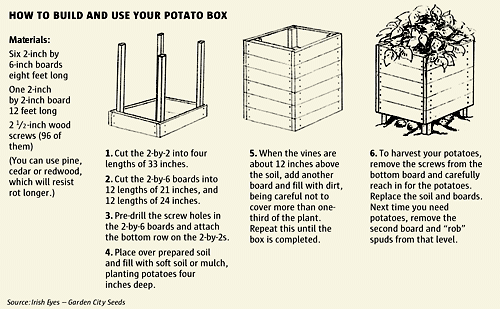 Follow these steps to build your own balcony potato tower! Make sure to “chit” your potatoes in the first few weeks. The method is simple: spread the potato seeds in open-top flats, one layer deep with the “seed end” uppermost. (If you closely observe a seed potato, you’ll notice that one end was attached to the plant, the other end has a larger number of eyes from which the sprouts emerge. This end with the eye cluster is called the seed end.) The flats are kept in a warm place (70 degrees F.) where light levels are medium in intensity (bright shade). 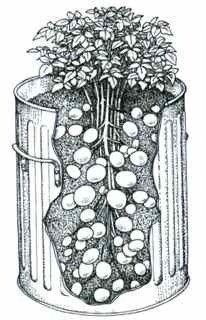 You can also build a balcony potato growing tower using a garbage bin. Ideally use a metal bin (or check the type of plastic your bin is made from to ensure it is a safe type of plastic for growing.) Simply drill holes in the sides and bottom for drainage, set up upon bricks, and plant your potato chunks (make sure each chunk has at least one eye!) in the bottom in the soil, adding soil throughout the season as the potato vines grow upwards.